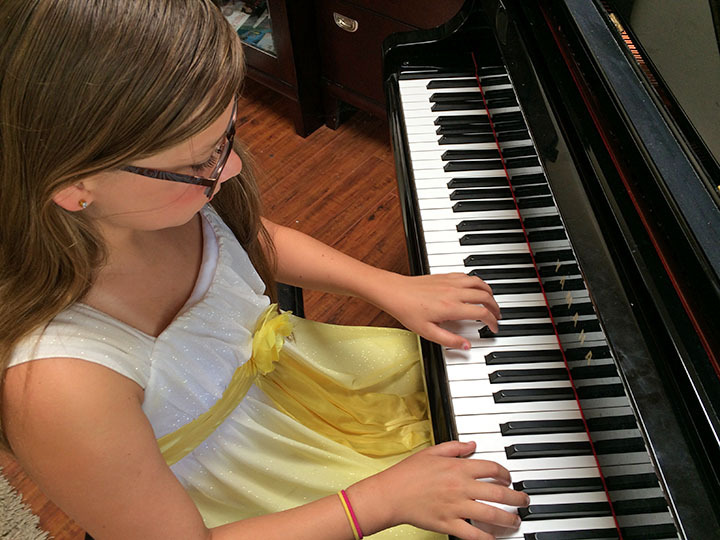 Nicole Salladin is one of Parkview School’s many talented piano players, having played both locally and internationally. Nicole started at Yamaha Music Academy of Fullerton at four years old, and has progressed significantly, performing in many annual Yamaha recitals at California State University, Fullerton, and holiday concerts at Harmony Music School. In addition, she has performed annually at the Brand Library & Art Center in Glendale, and other venues, such as Disneyland and downtown Brea. In 2011, Nicole enjoyed playing as a solo pianist with Mexico City’s Youth Symphony Orchestra. In 2012, she performed in Ensenada, Mexico, with the Ensenada Youth Orchestra, and, in 2013, she performed in a number of recitals and performances in Mexico, with the Guadalajara Youth Orchestra. At the 2014 NAMM show, Nicole also had the privilege of performing as part of a Yamaha youth ensemble. As part of her Yamaha training, she has performed self-written compositions. Nicole performs regularly with Parkview’s Variety Show, as well as the worship team at her church. Nicole has two siblings and many friends. She is an avid reader and learner, and also participates in competitive swim. She is one busy Parkview Panther! Be the first to comment on "Pianist Nicole Salladin is one of Parkview’s finest"